The upper unit of the Mudclaw 300 is flexible and durable, allowing for a reliable coverage to the foot, remarked some runners. Most reviewers appreciated the mesh lining and the water repellent coating that keeps the foot clean and dry. A large number of runners welcomed the protective components, such as the Gusseted Tongue, which keeps dirt from entering the shoe. EVA makes up the mid-sole layer and it’s coupled with the Meta-Shank groove design on the forefoot for more natural foot movement. The Dual-C outsole is made up of sticky rubber for more durability and grip on the surfaces. Some runners felt that the Mudclaw 300 wasn’t true to its size because it was one size smaller than the usual. Others thought that it was greatly missing the arch support needed for many runners who need such a feature. The testers noticed that the outsole wasn’t able to offer much traction on wet surfaces. The Mudclaw 300 from Inov-8 is a trail shoe that’s made for hard terrain and hardened trail enthusiasts who want to experience a solid option when adventuring. It’s sturdy, durable and comfortable to wear for neutral runners. This review is a little different in that it combines my review of the Inov-8 Mudclaw 300 with a report of my first ultra – the Pen Llyn Ultra Winter Race. Whilst the Mudclaw 300 is not a brand new model in the Inov-8 range, it remains the most recent iteration of one of their original shoes. The ultra-event took place in November 2018 and followed a couple of weeks of fairly heavy rain. Sections of the race included beach, trail, and road but by far the majority of the route crossed fields over hills and tracks of the stunning Llyn Peninsula of North Wales. The event proved to be a fantastic test for the Inov-8 Mudclaw 300 which provided more than sufficient cushioning and comfort on this terrain, combined with unrivaled grip. In November last year, I took part in the Lee Mill Fell Relays held in Rossendale, running in one of the teams from Eryri Harriers. If you’re not sure what’s involved in a Fell Race held in a Lancashire quarry as winter tightened its grip, just think sleet, snow and plenty of mud, then throw in a few bogs for good measure. I thoroughly enjoyed the event, apart from one exception - I was sliding around all over the place in my Salomon Speedcross 3 trail shoes and determined that the next time I tackled a race like this, I would have suitable footwear. Almost a year on, and I was preparing for the inaugural Pen Llyn Ultra Winter Race, a 35(ish) mile run on every terrain imaginable staged on the stunning Llŷn Peninsula. I did a couple of recces using my go-to all-terrain shoes, the Inov-8 Roclite 290. But as the event drew closer, we began to experience more and more of the rain that North Wales is famous for, and my thoughts turned to the Inov-8 Mudclaw 300. These had remained largely unused through a hot, dry summer and I was just itching to try them out in some mud. The Mudclaw 300 is a great looking shoe, especially in the bright yellow and black colorway. The shoe fit fantastically well right out of the box and was true to size (I’m a UK 13/US14/EU48-9). Those who are unfamiliar with Inov-8 shoes may find the “Precision Fit” a little small, and choose to go up by ½ a size. Personally, I find that they feel snug, that’s exactly the feel I want from an off-road shoe, especially on mixed terrain and with steep climbs and descents. The shoe holds the footwell which helps you stay in control and also prevents black toenails as the foot is prevented from slipping forward. The Mudclaw 300 actually has a little more space than either my Roclite 290 or Trailroc 270 each of which is a little tighter. The first thing to strike you is the incredibly aggressive sole, and it is hard to argue with Inov-8’s assertion that “every single cleat has been sized, oriented and positioned with performance in mind… everything from directional traction to the shedding of mud before the next strike phase”. After a couple of weeks of rain, the fields and bridleways around where I live were extremely wet and muddy, so I put the shoe right to the test. I must admit to being amazed by the grip. I have never previously worn a shoe that will take me up a steep muddy incline without any slipping. I had confidence in both ascending and descending at any pace, and there was never any concern with quick turns. The comparison photo shows the sole of the Mudclaw next to that of the Roclite and the Trailroc. What is more surprising is the way that the sole simply sheds mud. The design and layout of the lugs mean that however much mud I ran through, the sole was free of debris and always ready to attack and grip at the next footfall. The only minor issue I had was that often found small chunks of mud, presumably shed by the sole, would find their way into the shoe down the side of the ankle (the same applied to sand when running on the beach). With the rain persisting, I was ready to wear the Mudclaw 300 on race day. The communication in advance of the race was fantastic. As you’d expect, we received the usual information such as route maps, gpx files, road book and detailed instructions on checkpoints, honesty books and what to expect on race day. In addition, however, the inimitable race director Huw Williams set up a competitor's Facebook groups which became an incredible source of information and discussion, as well as somewhere where competitors could organize course recces together. Huw set up a Facebook live discussion ahead of the event, responded to all questions quickly, and posted regular updates on… pretty well anything to do with the event. So, on the morning of the race, I arrived to register and collect my number. Likeys had a pop-up shop at the event registration, and the evening before the race, Ant had left a message in the competitors Facebook group asking if anyone wanted anything specific to be brought along. In light of the issue of debris getting into the shoes, I asked for a pair of Inov-8 gaiters which they brought with them and even offered a competitors discount when I collected them in the morning. The Mudclaw 300 does not have the built-in clips for gaiters that some Inov-8 shoes have, but they come with a rubber loop to connect easily underneath the shoe. This was easy to fit, and whilst, unfortunately, the rubber loop came away during the race. The gaiters remained in place, did a great job throughout and to be honest, I didn’t feel them during the race, and hardly knew they were there. A race briefing from Huw half an hour ahead of the race advised us of a slight diversion near the end due to a bridge being under water. The remainder of the briefing simply reiterated the information (and Facebook Live session) that had been provided ahead of the event – I was ready to go. Out into the rain, a couple of orange flares lit, 10-second countdown and off we went along the coastal path from Pwllheli towards the Llanbedrog. I started the race with Tony, a friend and fellow Eryri Harrier runner who had completed the 75 mile Pen Llyn Ultra back in June. Barring any mishaps, we planned to run the whole race together, and as this would be my first ultra-race, I hoped to learn from Tony’s experience. The early section was a mix of hard-packed trail and wet fields. The fields were no problem in the Mudclaw 300, but the surprise was the comfort of the shoe on the hard trail. Where I’d expected that it may be a little unforgiving, the EVA foam does its job to provide sufficient cushioning. As with most of today’s shoes, the upper is made of a synthetic mesh, though this shoe incorporates a protective “rand” which is stitched around the lower part of the upper, protecting the foot from projecting rocks. The reinforced toe bumper comes a little higher too. The inside of the midfoot upper is cushioned for comfort. This extends around the heel cup and incorporates moisture wicking properties to keep the foot dry in moderately wet conditions. It was clear that the moisture wicking properties would be no use to me on this day, however, as we descended onto the beach at Llanbedrog, or at least where the beach would be if the tide hadn’t come in a couple of hours earlier. Wading knee deep in sea water over rocks and around trees, I only tripped and fell once, but was never tempted to swim as one runner chose to do. Out of the water, back onto the coastal path, up the steep steps towards the Tin Man (I was grateful for the handrails), I expected the tell-tale squelch of soggy shoes to accompany me for the next few miles, but it wasn’t to be. The shoes quickly drained of water during the ascent and after ripping a page from the honesty book at the foot of the Tin Man, we headed off toward Abersoch. As the light rain showers continued during the next section of narrow, muddy and occasionally-rocky coastal path, I was able to gauge the performance of the shoe on wet rock. The sole does incorporate “anti-slip traction”, but to be honest it isn’t great on wet rock. I did find that I had to be careful, avoiding the rock where I could step between muddy sections, and taking rocky descents a little more slowly that I may in something like the Roclite. Nevertheless, the Mudclaw isn’t designed for rocks, and it would come into its own very soon. As we descended from the Llanbedrog headland, marshals directed us inland. There would be no more swimming today – in light of the high tides, we took the road for a couple of miles to Abersoch rather than along the beach. This diversion was well marshaled and we were directed clearly all the way. After a total of around 7 miles, we reached Abersoch and headed onto the Llwybr y Morwyr, or “Sailors Path” that would primarily follow undefined footpaths across fields and hills North across the Llyn Peninsula to Nefyn. In my mind, this was where the race really began, and the Mudclaws would prove hopefully prove their worth. The route was across the soft ground which got very muddy in places, and there’s not much to say about the Mudclaws except that they delivered in every way. The sole provided so much grip on this type of ground that there was never any concern about slipping, however wet and muddy the ground became. Added to that, the EVA foam in the midsole provides sufficient comfort and cushioning throughout. The excess sea water had drained out of the shoes which were great at repelling water from the occasional puddle or stream so that the feet remained no more than a little damp for the remainder of the race. I’m sure that this section of the race was of greatest concern to competitors in terms of navigation, and for that reason, I’d done a recce of this part a couple of weeks previously. It turns out however that I’d have managed without; the course had been really well marked out with sufficient flags to keep us on the straight and narrow, and wherever the route crossed roads, there were always marshals in place to point us in the right direction. Up until the Pen Llŷn Ultra, most of the races I’d taken part in had been either road races, or shorter fell/mountain races, and the “feed stations” would offer cups of water, sometimes isotonic drink or gels and occasionally jelly babies. My first experience of a feed station in this race was approx. 9 miles in, just before we were to head over Mynytho Common. We ran into the checkpoint to be greeted by at least half a dozen incredibly supportive marshals who sprang to our aid, relieving us of the page we’d ripped from the honesty book by the Tin Man, refilling our drinks bottles and offering a variety of sweet and savory snacks before checking that we were warm enough and cheering us on our way. This enthusiastic spirit of friendliness and support was echoed at every checkpoint we came to, and in every marshal who stood in the rain for hours on end to direct us on our way. We left the warm bosom of Checkpoint 1 to head over Mynytho Common. This section of the course is rather exposed, and whilst well marked, I was glad to have run the route a couple of weeks earlier as this made navigating easier, and allowed us to maintain a good pace through the wind and showers. The “muddy pastureland” theme continued as we passed over the common, and visited “the scarecrow” to collect the next honesty-book page before ascending to pass between the peaks of Garnfadryn and then down to Checkpoint 2. Once again we were welcomed, bottles refilled and offered tea and coffee as well as a huge variety of snacks. We had a decision to make at his point; because the final ten miles or so would be on tarmac, we both carried road shoes to change into. The next section of approx. 3-4 miles up towards Morfa Nefyn would also be on tarmac, and we considered a quick shoe change, but the thought of putting muddy trail shoes back on again afterward meant that we kept the trail shoes on. It will come as no surprise that Mudclaws are not designed for running on tarmac. A bit of hard trail is no problem and a few hundred yards of a road here and there won’t cause any lasting damage. Having completed almost 2½ hours of running, however, the cushioning that was more than sufficient on muddy grassland was lacking somewhat on roads, and both the legs and the feet felt as if they were taking something of a pounding with each stride. It wasn’t long however before we were back onto fields, and greeted with the incredible view of Nefyn Bay as we descended through the golf course and into Checkpoint 3, located in the Ty Coch pub on the beach at Nefyn. This was a close as you’ll get to a halfway point in terms of distance, and it had taken us just over three hours. As the wind continued outside and the rain began to pick up again, we headed to the checkpoint inside the pub where we enjoyed more snacks and a fantastic cup of French Onion soup before quickly escaping outside before succumbing to the lure of the open fire and draught beer! The tide lapped at our feet as we made our way along the beach before a steep climb to the coastal path which would take us almost 10 miles to the next honesty book at the highest point of the route. To be honest, I found this next section to be the hardest of the run. The rain began to come down hard as we ran slowly along the coastal path, and the wind was gusting strongly off the sea. Once again, the course was very well marked, and Tony had run this section in the summer, so navigation wasn’t an issue. The route seemed to have more than its fair share of elevation and the views were pretty stunning despite the conditions. As we rounded Penrhyn Glas above the quarry, we were treated to a rainbow as the sun came out and the spirits lifted as we descended to the quarries below the Nant Gwrtheyrn Welsh Language and Heritage Centre. The next three miles would see us climb almost 400m out of Nant Gwrheyrn and up to the BT mast just below the Garn For the peak of YrEifl. Most of the route would now be on tarmac, so we took the decision at this stage to change into road shoes and dry socks, pick up a drink from the café, and head uphill. In terms of shoes – I completed the rest of the route in a pair of New Balance Fresh Foam Beacons due largely to them being lightweight having a fantastic amount of cushioning! The Mudclaws spent the rest of the journey strapped to my backpack. Fortunately, for all that they have a thick, aggressive sole, the shoe is fairly light at 300g (that’s the “300” in the Mudclaw 300), and even my UK 13’s were only 344g per shoe, and so they didn’t add too much weight to the backpack for the remainder of the race. You’ll find my overall summary of the shoe’s performance below. The ascent out of Nant Gwrtheyrn was taken at a walk (and I can’t even pretend it was a brisk walk), though we were somewhat invigorated by the fresh shoes and socks. As the road finally flattened out, we were directed up a track by another couple of friendly marshals and that’s when we saw for ourselves Huw’s final sting in the tail: the long climb up to the BT mast. We could see a few tiny figures coming back down from the mast, and there was no alternative but to grit our teeth and get up there, safe in the knowledge that once we’d got there, the final 10 miles would be (almost) downhill all the way. We were greeted at the final steps to the mast by Dylan who cheered us on to the top and collected the pages we’d ripped from the highest honesty book on the course. The accompanying picture wasn’t taken on the day but does show the incredible views from the BT mast on the right day. We wearily began the descent into Llithfaen and Checkpoint 4 at the Tafarn y Fic – another warm and friendly pub with a snack, hot drinks and encouraging marshals. We were soon back on the road and headed downhill almost too enthusiastically before we both found our legs were giving the early warning signs of cramp, and suggesting that we may wish to slow the pace a little! We took heed and ran slowly with regular walk breaks as we headed to the final checkpoint in Huw’s farmhouse kitchen where we took a handful of goodies and a cup of soup before tackling the final few miles. The sun was setting as we made the short ascent to the top of Pen Garn for the final honesty book, and a little more encouragement from the marshals at the top, before we descended down into Pwllheli for the final mile back to the finish at the golf club. The race was won by the incredible Huw Brassington in 6 hours, and the final competitors crossed the line four hours later in time for the 10-hour cut off. Despite the 4 hours difference between first and last finishers, everyone crossed the finish line to cheers and congratulations as well as the all-important finishers medal! I’m confident that after the experience of this event, it won’t be my last ultra. The organization both before and throughout the race was excellent. Huw Williams is the Llyn Peninsula’s very own Doc Brown (if I’d have asked whether the route followed defined paths I wouldn’t have been surprised to hear him respond “where you’re going, you don’t need paths!”). He has a fantastic way of making the competitors feel very special and part of a family rather than simply a number. I’d recommend his other ultra-events which can be found here. They all take place amongst the fantastic scenery of the Llŷn Peninsula and offer a great way to enjoy the beautiful surroundings. The marshals along the route and at every checkpoint were always friendly and encouraging, sending you on your way with a smile on your face. As for the Mudclaws – the image here shows the shoes exactly as they were when I took them off at the end of the race. They hadn’t been cleaned, and there was no need to scrape off any mud. As you can see, the sole is completely clear of mud and debris, exactly as it had been for the whole of the race. Inov-8 make some excellent trail shoes for a variety of terrains and weather conditions. The Trailroc is fantastic for moving quickly over dry, rocky or hard-packed terrain. The Roclite is a fantastic all-rounder that’ll comfortably get you through most conditions. If you’re expecting wet, soft, muddy conditions, then the clue is in the name. This shoe will claw through the muddiest of terrain, quickly and easily shedding debris before your next footfall to give you confidence with every step. They surprised me with how comfortable they were even after several hours of running, and whilst the legs showed clear signs of fatigue, the feet remained in great condition. At the end of this event, there wasn’t a single blister or sore spot anywhere on either foot. If your run includes a mix of terrain, you may need to think carefully, as this shoe isn’t great for long distances on hard surfaces, though don’t be put off if you follow the odd path to reach your off-road run. If you’re expecting muddy stuff, however, don’t forget to pack the Mudclaws. You know, minimal shoe, drains well, looks great, fantastic grip. As far as an overall OCR shoe, I highly recommend the Inov-8 Mudclaw 300. The upper is near mountain shoe perfection, and the outsole is sticky, aggressive, yet still runs ok on harder terrain (and much better than inov-8’s x-talon and Terraclaw outsoles). 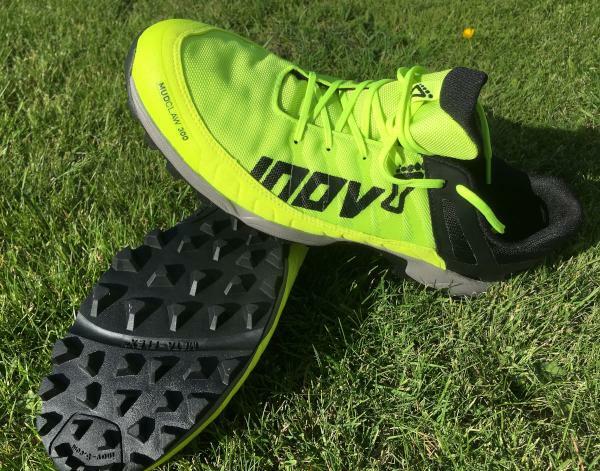 The Inov-8 Mudclaw 300 delivers an impressive grip on every step even on muddy and soft terrain through the 8mm aggressive studs with multi-directional pattern. The studs allow runners to survive the soft ground running. Enhanced durability and protection is what this shoe offers. It comes with a great combination of hard and medium sticky rubber in the outsole for long lasting durability. The upper and toe bumper is also designed to deliver outstanding protection, keeping the foot free from stone bruising and other trail running damages. Just like most of the Inov-8 running shoes, the Mudclaw 300 has a standard running shoe length. It is a unisex running shoe that is available in several sizes ideal for both men and women. The heel, midfoot and forefoot comfortably accommodate those with narrow forefoot. The Mudclaw 300 uses the Mudclaw off-trail outsole that gives reliable traction and the aggressive lugs offer impressive grip especially on wet and muddy surfaces. The Endurance Rubber Compound id designed for optimal grip on wet conditions and maximum running performance. The midsole of the shoe uses the 2-arrow Shoc-Zone that delivers moderate underfoot cushioning. It also utilizes the traditional EVA midsole foam that is extended in the entire midsole to deliver cushioning and flexibility. The Meta-Shank is strategically placed in the midfoot to the forefoot for added impact protection and underfoot flexibility. The upper of the Inov-8 Mudclaw 300 uses synthetic mesh covers that deliver breathable coverage without being too bulky and heavy. The met-cradle in the upper gives added forefoot support and secure fit. It has nylon lacing system that utilizes the brand’s traditional nylon lacing support, delivering a secure and comfortable fit. The 6mm footbed provides added underfoot comfort.